The Cinnamon Weaver Ploceus badius occurs in Sudan and South Sudan. The male in breeding plumage has a black head and chestnut body, closely resembling the Chestnut Weaver P. rubiginosus. The Cinnamon Weaver is distinguished from the Chestnut by yellow wing edges (rather than pale) and yellow vent (rather than brown). Also their ranges are mostly separate. Female and non-breeding male Cinnamon Weavers are sparrowy, streaked above, and with olive-green heads and yellow eye-stripes. 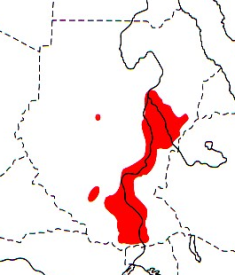 The Cinnamon Weaver is found in Sudan and South Sudan, especially along the Nile River and its tributaries, as far north as 16Â° N, and south to the Uganda border (see red on map left, based on Birds of Africa). It is common to locally abundant. It occurs in some protected areas but is apparently hunted in Bandingilo National Park. No subspecies are currently recognised. The Cinnamon Weaver inhabits tall grassland near rivers, with some bush and scattered trees. Its diet includes seeds. It is gregarious, occurring in small flocks in the non-breeding season. It roosts communally in tall trees. The Cinnamon Weaver is colonial and may be monogamous. Colonies may be large or small. The male displays from the nest or nearby vegetation. The nest is roughly globular, with an entrance at one side. It is closely woven from grass blades and strips torn from sorghum leaves. The nest is placed 1.5-2 m above the ground or water. It is supported by vertical stems, in tall grass in flooded areas, or suspended on twigs in trees. The clutch is 2-3 eggs, which are lightly or heavily spotted. Very little is known about this species and its breeding habits, and a few more PHOWN records will provide much more knowledge about the nesting sites and colony sizes of this species. The Cinnamon Weaver has one PHOWN record, a colony of 8 nests, being the first time a colony size has been recorded for this species (see PHOWN summary). Submit any weaver nest records to PHOWN (PHOtos of Weaver Nests) via the Virtual Museum upload site.